Macrophage-mediated vascular bursting. 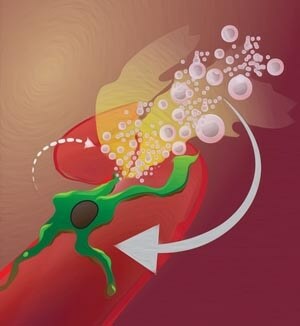 In this illustration based on in vivo microscopy, a tumor-associated macrophage (green) induces a burst of leakage from a tumor blood vessel (red), which releases nanoparticles into the tumor tissue (yellow). The large arrow shows nanoparticles being taken up by the macrophage, while the small dashed arrow depicts how the macrophage elicits further nanoparticle delivery via vascular bursting. CREDIT: Miles Miller, PhD, and Ralph Weissleder, MD, PhD; Center for Systems Biology, Massachusetts General Hospital. Scientists from the Massachusetts General Hospital (MGH) have discovered an astonishing new role for the immune cells known as macrophages—enhancing the efficaciousness of nanoparticle-delivered cancer treatments. In a report published in the journal Science Translational Medicine, the researchers narrate the way in which they discovered how suitably timed radiation treatment can enhance the delivery of cancer nanomedicines to nearly 600% by attracting macrophages toward tumor blood vessels, thus leading to a transient “burst” of leakage from capillaries into the tumor. The field of nanomedicine has worked to improve selective drug delivery to tumors for over a decade, typically by engineering ever more advanced nanomaterials and often with mixed clinical success. Rather than focusing on the nanoparticles themselves, we used in vivo microscopy to discover how to rewire the structure of the tumor itself to more efficiently accumulate a variety of nanomedicines already in clinical use. When cancer drugs are enclosed inside nanoparticles, pharmacokinetics, that is, the way in which a drug is absorbed, distributed, metabolized, and excreted, is enhanced by extending the presence of a drug in the circulation and by preventing the use of toxic solvents in the case of infusion chemotherapy. However, considering clinical practice, the delivery of nanoencapsulated drugs into tumors in patients has proved to be challenging, mostly due to familiar factors in the microenvironment of the tumor. The entry of drugs into tumor cells from the circulation is restricted due to high pressures inside the tumors as well as low permeability of tumor blood vessels. A research conducted by Miller and his team in 2015 demonstrated that tumor-associated macrophages have the ability to enhance the delivery of nanoparticle-based treatments to tumor cells, and radiation therapy has been recognized to improve the tumor vessels’ permeability. However, in-depth knowledge of the exact mechanism behind these effects and how these effects can be combined to improve nanomedicine delivery has been lacking. Hence this research aimed to answer these questions. Experiments of cancer carried out on mouse models showed that radiation therapy induced significant changes to the tumor microenvironment, such as changes in greater blood vessel size and permeability and a growth in the macrophage numbers in relation to tumor cells. Such changes were not evident till 3 to 4 days following the radiation therapy and vanished by day 11. Investigation of patient biopsy samples collected before and many days following radiation therapy for cervical or breast cancer showed considerable macrophage expansion in post-radiation samples, and the highest increases were noted in patients who received the highest radiation dosage. Further investigations based on mouse models revealed that 3 days following radiation therapy, the absorption of nanoparticles and not solvent-delivered drugs roughly doubled. Upon performing high-resolution in vivo microscopy, it was found that increases in vascular permeability were erratic, where spells of low permeability were interfered by a burst of vascular contents, such as nanoparticles, into the tumors. There was an increase in the bursting rate three days following the radiation therapy and the burst was found to be greater for larger blood vessels surrounded by macrophages. When macrophages were removed, the radiation-induced changes ceased and the absorption of nanoparticles increased. When radiation therapy was combined with cyclophosphamide, which is a DNA-damaging drug with the ability to improve nanoparticle delivery to tumor cells by means of similar tumor-priming mechanisms, the absorption of nanoparticles increased considerably. The effectiveness of combining radiation therapy with nanoparticle-encapsulated chemotherapy drugs and the main role of macrophages were confirmed by investigating the therapeutic effect of the strategy in a mouse model. When compared to the strategy of combining radiation therapy with a solvent-based drug, which had no effect as against using only radiation, administering a nanoencapsulated form of the same drug three days following radiation therapy removed a major portion of the tumors, an outcome that was considerably less when the number of macrophages reduced. Finding that this combination of radiation and nanomedicine leads to synergistic tumor eradication in mice provides motivation for clinical trials that combine tumor rewiring using radiation therapy with nanomedicine. Most of the treatments and nanomedicines employed in this study are FDA approved for cancer treatment, so this combination treatment strategy could be tested in clinical trials relatively quickly. And given the role of macrophages in this approach, we are particularly interested in combining tumor irradiation and nanomedicine with immuno-oncology therapies. Ralph Weissleder, MD, PhD, director of the MGH Center for Systems Biology is senior author of the paper published in the journal Science Translational Medicine. Ravi Chandra, MD; Michael Cuccarese, PhD; Christina Pfirschke, PhD; Camilla Engblom, PhD; Shawn Stapleton, PhD; Utsarga Adhikary; Rainer H. Kohler, PhD; James F. Mohan, PhD; and Mikael J. Pittet, PhD, all belonging to the Center for Systems Biology, are the additional co-authors of the study. Grants UO1CA206997, K99CA207744, R01EB010011, and P50GM107618 from the National Institutes of Health supported the research.